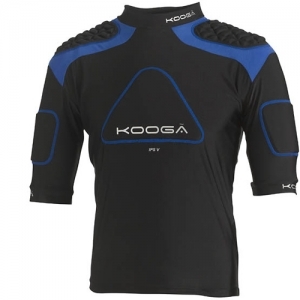 The new Kooga ‘Impact protection system’ pad range offers a ground breaking new look for Kooga. The IPS V offers 5 points of protection. CM² coverage has greatly increased since 2010/11 range. Pad shaping in ergonomically designed for ease of movement and comfort during play. Pad fit has been improved ‘Mould foam’ is jointed to allow a much better adhesion to the target areas of the body that require protection such as the shoulders and sternum. Padding to sternum and biceps.